What is Gandhian philosophy? It is the religious and social ideas adopted and developed by Gandhi, first during his period in South Africa from 1893 to 1914, and later of course in India. These ideas have been further developed by later "Gandhians", most notably, in India by, Vinoba Bhave and Jayaprakash Narayan. Outside of India some of the work of, for example, Martin Luther King Jr. can also be viewed in this light. Understanding the universe to be an organic whole, the philosophy exists on several planes―the spiritual or religious, moral, political, economic, social, individual and collective. The spiritual or religious element, and God, is at its core. Human nature is regarded as fundamentally virtuous. All individuals are believed to be capable of high moral development, and of reform. The twin cardinal principles of Gandhi's thought are truth and nonviolence. It should be remembered that the English word "truth" is an imperfect translation of the Sanskrit, "satya", and "nonviolence", an even more imperfect translation of "ahimsa". Derived from "sat"―"that which exists"―"satya" contains a dimension of meaning not usually associated by English speakers with the word "truth". There are other variations, too, which we need not go into here. For Gandhi, truth is the relative truth of truthfulness in word and deed, and the absolute truth―the Ultimate Reality. This ultimate truth is God (as God is also Truth) and morality―the moral laws and code―its basis. Ahimsa, far from meaning mere peacefulness or the absence of overt violence, is understood by Gandhi to denote active love―the pole opposite of violence, or "Himsa", in every sense. 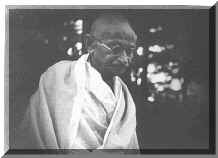 The ultimate station Gandhi assigns nonviolence stems from two main points. First, if according to the Divine Reality all life is one, then all violence committed towards another is violence towards oneself, towards the collective, whole self, and thus "self"-destructive and counter to the universal law of life, which is love. Second, Gandhi believed that ahimsa is the most powerful force in existence. Had himsa been superior to ahimsa, humankind would long ago have succeeded in destroying itself. The human race certainly could not have progressed as far as it has, even if universal justice remains far off the horizon. From both viewpoints, nonviolence or love is regarded as the highest law of humankind. Gandhian philosophy is also compatible with the view that humankind is undergoing gradual moral evolution. While conflict is seen as inevitable, in fact not always undesirable, violence as the result of conflict is not regarded as inevitable. Simply put, human beings do have the capacity to resolve conflict nonviolently. This might be difficult, but it is not impossible. Liberation from a violent society is seen as requiring many decades or longer―but it is not an impossible ideal. As already observed, Gandhi's thought is equally a philosophy of self-transformation. The individual's task is to make a sincere attempt to live according to the principles of truth and nonviolence. Its fundamental tenets are therefore moral. They include―resisting injustice, developing a spirit of service, selflessness and sacrifice, emphasising one's responsibilities rather than rights, self-discipline, simplicity of life-style, and attempting to maintain truthful and nonviolent relations with others. It should be understood that by simplicity is meant voluntary simplicity, not poverty, which has no element of voluntarism in it. If there is one thing Gandhi does not stand for, it is poverty. A Gandhian should also avoid political office. He or she should remain aloof from formal party politics and equi-distant from all political groupings. But this is not to say, and in my view Gandhi does not require, that the individual should remain aloof from all politics. For often injustice cannot be resisted unless the political power holders and structures are engaged nonviolently. What was the freedom struggle itself if not a political struggle, against the greatest concentration of political power the world had ever known, the British Empire? In my eyes, there is no particular virtue in attempting to avoid contact with politics. What must be avoided, however, is assumption of political power by a Gandhian (at least this is necessary in the short and medium terms in India), and cooperation with un-virtuous holders of political power on their terms. For the individual self-transformation is attempted with deliberateness rather than with haste. One should not seek to become a Mahatma overnight, because such attempts will surely fail, but to reform oneself over the whole of one's life, as far as one is capable. (Nor should there be any question of superficial imitation of Gandhi.) Gandhi viewed his own life as a process of development undertaken "one step at a time". He saw the need to continually "experiment with truth" (from which he derived the title of his autobiography) in whatever field, in order to come to see the truthful path. Though they were rooted in the highest idealism, the experiments were carried out on a very down-to-earth plane―India's moral, political and social needs as he saw them. Such an approach is available to all at all time. Gandhi believed his own moral and spiritual development to be far from complete at the time of his death. Despite the great heights he had attained, this was indeed true. He had not achieved perfection, as some of those who were close to him have testified. The remaining central concept in Gandhi's philosophy is Satyagraha. Defined most broadly (as Gandhi defined it), Satyagraha is itself a whole philosophy of nonviolence. Defined most narrowly, it is a technique or tool of nonviolent action. Because of the intention here to keep this discussion as simple as possible, Satyagraha will be described here in its latter guise. As a technique, Satyagraha was developed by Gandhi in South Africa to give the Indian population there a weapon with which to resist the injustices being perpetrated upon it by the colonial government. But Satyagraha can be practiced in any cultural environment―provided the necessary ingredients are present, not least Satyagrahis (those capable of Satyagraha). A Satyagraha campaign is undertaken only after all other peaceful means have proven ineffective. At its heart is nonviolence. An attempt is made to convert, persuade or win over the opponent. It involves applying the forces of both reason and conscience simultaneously. While holding aloft the indisputable truth of his or her position, the Satyagrahi also engages in acts of voluntary self-suffering. Any violence inflicted by the opponent is accepted without retaliation. But precisely because there is no retaliation (which can make the opponent feel his violence is justified), the opponent can only become morally bankrupt if violence continues to be inflicted indefinitely. Two factors are absolutely crucial to understand. There can be no Satyagraha in a cause which is not indisputably just and truthful. Nor can there be any element of violence or bitterness in a Satyagraha campaign―it must be conducted in a spirit of genuine nonviolence. Any campaign which is insincere in its spirit of nonviolence, or is not undertaken in a clearly just cause is not Satyagraha as Gandhi meant it. To sum up, Gandhian philosophy is not only simultaneously political, moral and religious, it is also traditional and modern, simple and complex. It embodies numerous Western influences to which Gandhi was exposed, but being rooted in ancient Indian culture and harnessing eternal and universal moral and religious principles, there is much in it that is not at all new. This is why Gandhi could say: "I have nothing new to teach the world. Truth and nonviolence are as old as the hills." Gandhi was concerned even more with the spirit than with the form. If the spirit is consistent with truth and nonviolence, the truthful and nonviolent form will automatically result. Despite its anti-Westernism, many hold its outlook to be ultra-modern, in fact ahead of its time―even far ahead. Perhaps the philosophy is best seen as a harmonious blend of the traditional and modern. The multifaceted nature of Gandhi's thought also can easily lead to the view that it is extremely complex. Perhaps in one sense it is. One could easily write volumes in describing it! Yet Gandhi described much of his thoughts as mere commonsense. Dr. Diwakar sums up Gandhi's thoughts in a few words: "The four words, truth, nonviolence, Sarvodaya and Satyagraha and their significance constitute Gandhi and his teaching." These are indeed the four pillars of Gandhian thought.